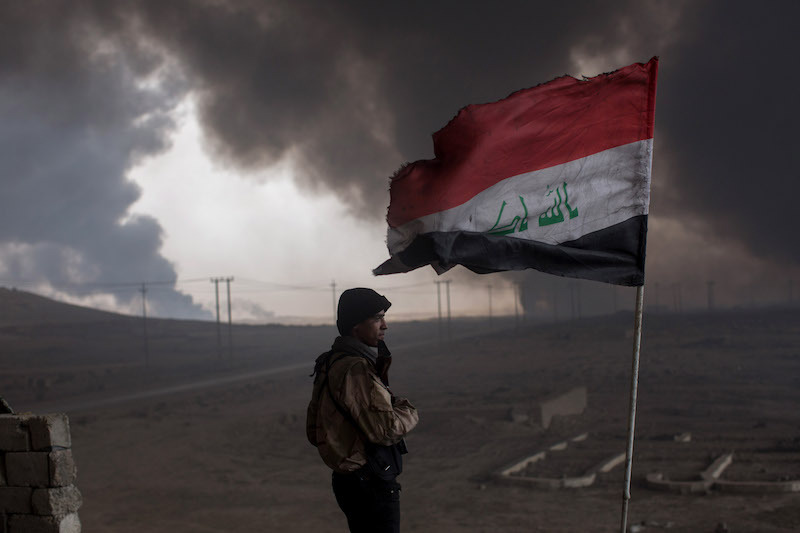 A fighter from a local tribe keeps watch from his rooftop outpost under smoke filled skies from burning oil wells set on fire by fleeing ISIS members on November 10, 2016 in Al Qayyarah, Iraq. The knock came one night late last year, a persistent bang on the metal door. The family inside shuddered as the sound echoed through the sparsely furnished farmhouse. Officially, their village had been liberated from the so-called Islamic State in October 2017, along with the nearby town of Hawija. But the military campaign had been hasty. The militants had sought refuge in the nearby mountains, leaving Iraqi forces to sweep through the area unchallenged. Now it was November, a month after ISIS had ostensibly been vanquished, and the militants were back. The elite Iraqi units that had fought ISIS on the battlefield were gone, and the forces who had replaced them were poorly trained and thinly spread across these vast, hilly areas, honeycombed with riverbeds and irrigation channels that offered the insurgents plenty of hideouts. On that fall night near Hawija, Imad, a father of five who asked that his real name not be used because he fears reprisals from both ISIS and the Iraqi security forces, told his brother to get a gun, while he himself slowly stepped into the dark. These days, almost no one dared venture outside after dusk. Everyone knew that the night belonged to ISIS. Just seven months after Prime Minister Haider al-Abadi declared victory over ISIS in Iraq, the jihadists have regrouped and are stepping up guerrilla-style attacks. ISIS is re-emerging as an insurgent force that thrives on the weakness of the Iraqi state, which alienates its people with poor services and abuse at the hands of security forces. Despite the $5.6 billion allocated by the U.S. since 2015 — including an administration budget request for $850 million for 2019 — analysts say that the skills Iraqi troops acquired during the past four years won’t be sufficient. The Iraqi government’s lack of coordination with the Kurds has left a political and military vacuum in the heart of ISIS territory. “Who is it?” Imad called out. “Come closer,” a male voice replied from the shadows. When there was no answer, the brothers opened fire, repelling the intruders. But the militants would soon return, pressuring the family to give them food and water and spreading fear across the village. Incidents like this one have become daily occurrences in this remote patch of northern Iraq, an area spanning thousands of square miles across the provinces of Kirkuk, Salahuddin, Diyala, and Sulaimaniyah. Just seven months after Prime Minister Haider al-Abadi declared victory over ISIS in Iraq, the jihadists have regrouped and are stepping up guerrilla-style attacks. ISIS operates with ease, especially in rural areas and at night, according to interviews with three dozen civilians, community leaders, and local security forces conducted over nearly three weeks this summer in and around the towns of Hawija, Kirkuk, and Tuz Khurmatu. The militants show up on people’s doorsteps asking for food and call civilians’ cell phones to demand the whereabouts of government security forces. Multiple civilians described seeing ISIS fighters move through villages in broad daylight, sometimes entering mosques to ask worshippers for zakat, a charitable contribution under Islamic law.The roads connecting the towns of Kirkuk and Hawija are riddled with craters and lined with broken power lines, the result of improvised explosive devices planted overnight to disrupt traffic and the electricity supply. With kidnappings for ransom on the rise since ISIS’s official defeat, parents fear letting their children leave the house, while villagers tell of the grisly killings of community leaders who, along with local security forces, are considered the group’s fiercest opponents. In a particularly gruesome incident that sparked national outrage in June, ISIS kidnapped eight people, including members of the Iraqi security forces, at a fake checkpoint set up along the Kirkuk-Baghdad highway and executed them all. In response, al-Abadi ordered the immediate execution of 12 ISIS convicts on death row and launched a fresh operation to go after ISIS in the provinces of Salahuddin, Diyala, and Kirkuk. Soldiers from the Emergency Response Division, an elite unit of the Iraqi Ministry of Interior, on the lookout for ISIS militants during a recent clearing operation west of the city of Tuz Khurmatu in Salahuddin. The campaign, which the government solemnly dubbed “Revenge of the Martyrs,” lasted two weeks and involved a range of security forces, including Iraq’s Emergency Response Division, or ERD, an elite Iraqi unit once trained by the U.S. that reports to the interior ministry; the Popular Mobilization Forces, an umbrella group of mostly Shiite, government-sanctioned militia; and the federal police. But over the course of several days with these units in July, I watched them employ ineffective tactics based on insufficient intelligence; the “Revenge of the Martyrs” seemed more like a bid to calm public anger than a genuine effort to secure the area. Take a look at Part 1 of our television series with PBS NewsHour Weekend. Iraq’s security forces are unprepared for the fight they now face. Though weaker than during the days of the caliphate, ISIS is re-emerging as a formidable insurgent force that thrives on the perennial weakness of the Iraqi state, which alienates its people with poor services and abuse at the hands of security forces. Those forces, meanwhile, lack the training, local knowledge, and trust from communities to prevail over the militants whose recent, brutal rule has so terrified civilians that they don’t dare to resist. 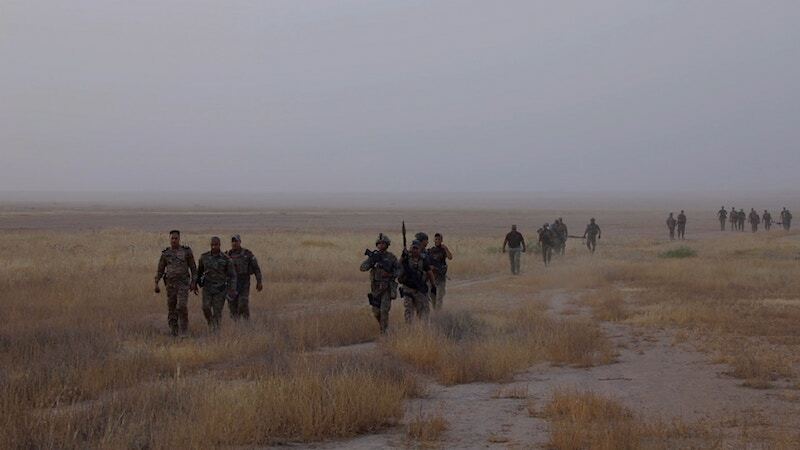 During the July clearing operation, two ERD brigades moved out of their base in the town of Tuz Khurmatu. Dozens of Humvees and pickup trucks mounted with machine guns drove through the desolate landscape. Braving 120-degree temperatures, the government fighters set up positions on hilltops overlooking the Adhaim river, a tributary of the Tigris that originates from the Kurdish Mountains to the east and cuts west across Salahuddin. “Any boat you see, anything moving, just shoot,” Gen. Thamer Mohammed, who leads the ERD, told his troops at one of the outposts. 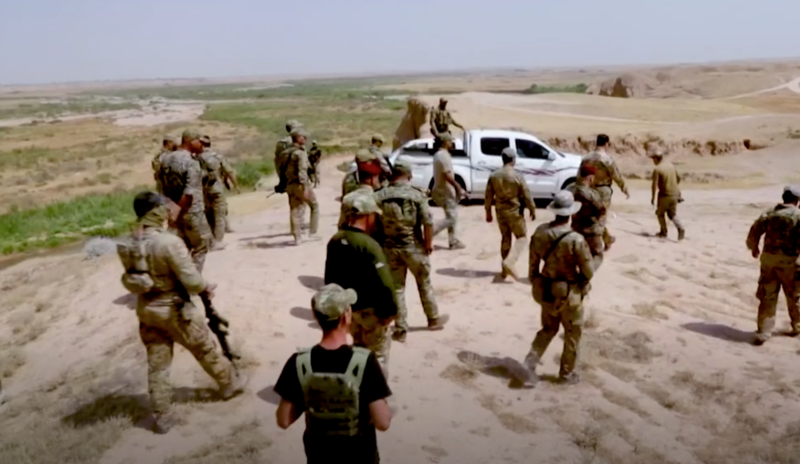 The ERD was trained by U.S. forces before 2014, according to an ERD spokesperson, and became one of the key forces fighting the recent war against ISIS. But in 2015, it was blacklisted under the Leahy law, which prohibits giving U.S. military support to foreign armed groups implicated in human rights violations. The U.S. didn’t train or equip the ERD during the war against ISIS, but sources told The Intercept the U.S. continued to provide tactical advice and air support. Two years later, during the battle for Mosul, an Iraqi journalist published photographs and videos of ERD soldiers torturing and executing civilians. A U.S. military spokesperson said at the time that an investigation into the alleged atrocities was “warranted,” but argued that the Leahy law didn’t prevent the U.S. from continuing to work with the ERD. The public outcry in the West that followed doesn’t appear to have strained the ERD’s ties with the U.S. military. One day, while sitting in a mansion that his forces had commandeered in Tuz Khurmatu, Mohammed proudly showed me an email from a U.S. officer congratulating him on the one-year anniversary of the liberation of Mosul. Take a look at Part 2 of our television series with PBS NewsHour Weekend. Though Mohammed says he deemed U.S. assistance invaluable in winning the mostly conventional war against ISIS, the ERD’s experience on the battlefield hasn’t prepared it to face an insurgency. As part of the July operation, hundreds of government fighters, followed by a column of Humvees, walked three miles through an area where intelligence officers expected to find between 60 and 120 militants. The scene was imposing, reminiscent of the big battles Iraqi soldiers had fought during the war. But in these barren lands, the government forces were visible from miles away — and the militants were nowhere to be found. After two days of searching, the ERD fighters, bored and exhausted from the scorching heat, hadn’t arrested or killed a single insurgent. But there would be no continuity. The same evening, while eating dinner, Mohammed received a phone call from Interior Minister Qasim Al Araji ordering the ERD to immediately deploy to southern Iraq, where violent anti-government protests had erupted just days before. As the two ERD battalions withdrew from the areas around Tuz Khurmatu, they once again left a gaping security vacuum, effectively surrendering the “cleared” areas back to ISIS. 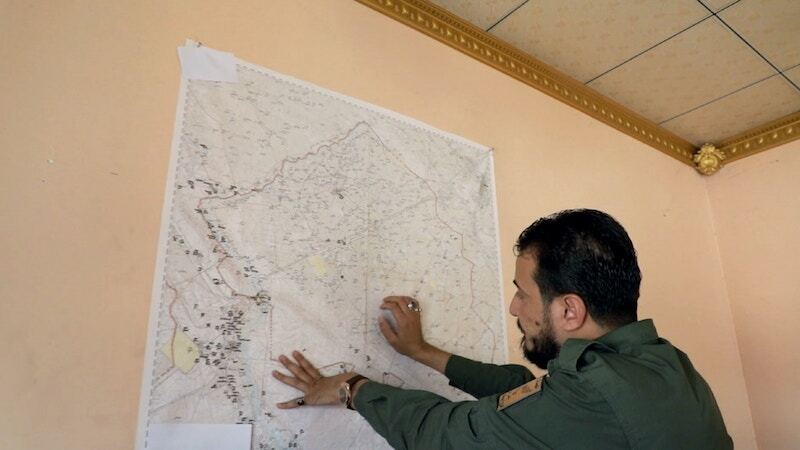 In his office in Hawija, Osama Al-Shameri points out areas where ISIS operates today. The July operation was consistent with previous failed attempts to uproot ISIS, which seemed adept at responding to the new reality. 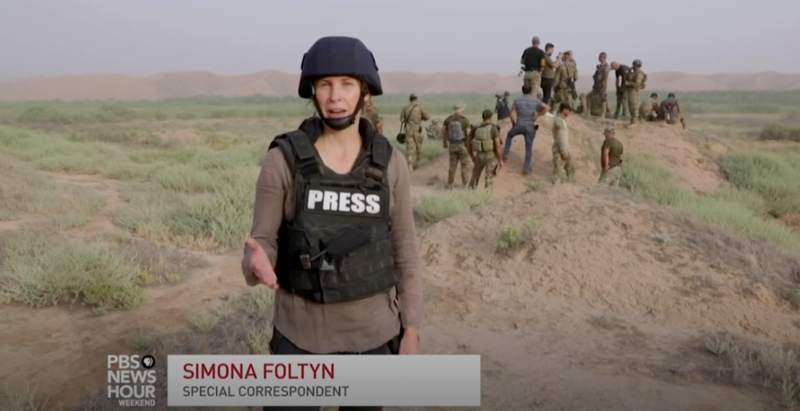 “[ISIS’s] strategy is basically to duck under the wave, let the clearing operation pass, and then ISIS can resume its operation,” said Jennifer Cafarella, director of intelligence planning at the Institute for the Study of War in Washington, D.C.
Iraqi security forces, meanwhile, are not keeping pace with the changing nature of the war. Despite the $5.6 billion allocated by the U.S. to train and equip them since 2015 — including an administration budget request for $850 million for 2019 — analysts say that the skills Iraqi troops acquired during the past four years won’t be sufficient to defeat ISIS in its current form. Though ISIS has lost the bulk of the 22,000 square miles of territory it held at the peak of its reign in Iraq, a recent U.S. government report estimates that a staggering 15,500 to 17,100 ISIS fighters have survived in Iraq alone. These fighters, thought by observers to be leaderless since their defeat in Mosul, are now regrouping amid a gradual reconstitution of ISIS’s command and control structure. The lack of military capability to fight ISIS isn’t the only problem. Another is the Iraqi government’s lack of coordination with the Kurds, leaving a political and military vacuum in the heart of ISIS territory. No place lends itself quite as well to the militant group’s resurgence as the areas surrounding the rugged Hamrin Mountains. Partly located in disputed areas claimed by both the Kurdish Regional Government in Erbil and the central government in Baghdad, the mountains fall into a buffer zone that isn’t effectively controlled by either side. “The presence of ISIS in our area is because of the security vacuum between us, the government of Iraqi Kurdistan and the government of Iraq” said Dler Ghazi, a senior official from the Kurdish Counterterrorism Group who used to be based in the contested town of Tuz Khurmatu. The region has been caught in a tug of war: Kurdish forces, including Ghazi’s, have managed security in disputed areas since 2014, when the Iraqi army collapsed in the face of ISIS’s sudden advance. The ERD took over last October, but Ghazi claims that the Iraqi government force lacks the local knowledge to fight an insurgency. “They aren’t serious about clearing the area. Until today, none of the security forces have contacted me to ask me what I know about the region,” Ghazi said resentfully. Ghazi took me to the village of Bashtapa, nine miles east of Tuz Khurmatu, where a handful of Kurdish Peshmerga volunteers man the last Kurdish outpost. “From here onward, it’s ISIS,” he explained, pointing toward the nearby hills that serve as both a dividing line between Kurdish and Iraqi forces and a safe haven for the militants. On his phone, Ghazi showed me pictures of bearded ISIS fighters, taken by his undercover intelligence officers just half a mile from the outpost. But even if Kurdish fighters spot an ISIS militant, the current attempt by Baghdad and Erbil to stay out of each other’s way means they can’t pursue him beyond Kurdish areas. Disgruntled and marginalized after losing disputed areas to the federal government last October, the Kurds now emphasize their importance in the fight against ISIS as a way of gaining political capital they may be able to use in the ongoing negotiations between Erbil and Baghdad. Ghazi believes that unless the Iraqi government sets up a joint operations command with the Kurds, the terrorists will expand their reach. In addition to the area’s political geography, its sectarian composition makes it ripe for ISIS’s return. As followers of an extremist version of Sunni Islam, the militants rely on grassroots support from within Iraq’s Sunni community. The group was particularly popular in areas around the town of Hawija, according to security officials. The tribes in the area had close relations with Saddam Hussein and received preferential treatment under his rule. When the Sunni dictator fell in 2003, the area quickly became a bastion of resistance against the Americans and the new Shiite-led government, turning it into a fertile recruiting ground for groups like Al Qaeda and ISIS. In June 2014, Hawija fell to the militants along with Mosul; it was one of the last towns to be freed in late 2017. But unlike the grueling, nine-month battle for Iraq’s second-largest city, the Iraqi recapture of Hawija took almost three weeks. With their caliphate crumbling, the militants sought to avoid unnecessary casualties. They retreated to the mountains and prepared for the insurgency that would soon follow. On a map in his office at the edge of Hawija, he draws a circle around the town as he points out dozens of villages and mountain ranges where ISIS operates today. “The very dangerous areas are here,” he said, pointing to the Makhool mountains west of Hawija. Mountains to the north and south, the former running along the buffer zone between Kurdish and Iraqi forces, offer a protected zone in which ISIS can move fighters and goods. 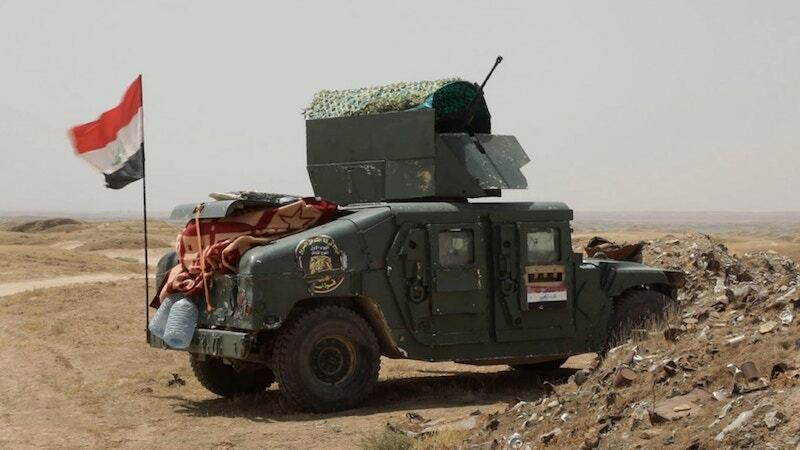 Al-Shameri’s Badr brigades form part of the Popular Mobilization Forces, or PMF, which, along with the federal police, are in charge of security in Hawija. Civilians in this Sunni district fear the mostly Shiite force, which was accused of committing human rights abuses against Sunni civilians during the war against ISIS. Al-Shameri, who hails from Baghdad, says that most militants operating in Hawija are native to the area. He considers their families to be collaborators by association. For this reason, authorities keep families of ISIS fighters in closely guarded camps. To return to their villages, civilians need approval from security forces, which is rarely granted to relatives of suspected or convicted militants. Even if they were allowed to leave the camps, there would be nowhere for these families to go. Villagers and tribal elders say that the PMF systematically destroys houses belonging to the families of ISIS suspects in an attempt to root them out. Separating uninvolved civilians from collaborators is difficult, and failures to do so have deepened rifts in Iraqi society. Many civilians say that security forces unfairly accuse the local population of collaborating with ISIS. One man who lives in a village near Hawija told The Intercept that the federal police and the Badr brigades arrested his brother and two cousins after they were found with weapons. The security forces accused them of belonging to ISIS. But the man, who spoke on condition of anonymity because he feared retaliation from government forces, insisted that the detainees were in fact part of a local Sunni militia formed to defend the village from ISIS. After the arrests, all the men in the village deserted the militia for fear of being targeted. “We have informed them that we will not support the security forces again, even if we see ISIS,” the man said. The man alleged that the arrests were made to extort ransom from the family. A federal police official told him that his three relatives were being held in a secret prison, the man said. After he paid the official a bribe, they were transferred into formal custody and, amid lack of evidence, are likely to be released. The Intercept did not contact the federal police for comment on the matter, in order to protect the detainees and the man who shared the story. The local Sunni militia are officially part of the PMF, but they are poorly equipped and wield little power compared to the Shia factions of the force or the federal police. Nevertheless, they often find themselves at the forefront of the fight against ISIS. As part of their tactics to assert control over rural communities, ISIS often targets local PMF fighters, their families, and community leaders who oppose the militants and their families’ return to the villages. They also threaten civilians who collaborate with security forces. Amid lack of protection from government forces, the local population often has no choice but to comply with the militants’ demands. A Humvee from the 2018 deployment of troops from the Emergency Response Division, Popular Mobilization Forces, and federal police in northern Iraq. Imad, the farmer who shot at ISIS fighters when they knocked on his door, knows that all too well. A few months after they showed up on his doorstep, the militants began calling his cellphone. He soon recognized the voices on the other end of the line. Imad says he immediately got in touch with a federal police intelligence officer. The officer asked him to keep speaking to the militants, record their phone conversations, and comply with their demands until there was an opportune moment to intervene. Imad willingly cooperated, expecting that the security forces would protect him and eventually chase the militants from his village once and for all. But things turned out quite differently. After a series of phone calls in which Imad agreed to supply the militants with food, ISIS finally showed up on Imad’s farm. “We are in the place where we agreed,” an ISIS militant can be heard saying in one of the taped phone conversations. “Are you behind the river?” Imad asked. Imad called his police contact, informing him of the militants’ precise location. He then took the water and some fruit and made his way to the meeting place. The seven men he encountered there hardly looked like the terrifying group that had ruled over his village for more than three years. “They were dirty, covered with dust, and looked very tired,” Imad said. The militants asked him to get more food from the market. Imad complied, all the while staying in touch with the federal police. When the police finally showed up, they ignored the farmer’s advice on how to corner the militants. Instead, they took up positions on top of his house, parts of which were burned during the subsequent firefight. All seven of the ISIS fighters managed to get away. As the federal police withdrew, they left behind a shell-shocked and petrified family. Fearful that the militants might return to take revenge, Imad decided to take his wife and five children to the nearby town of Abbasi. On the way, the federal police stopped him at a checkpoint. To his surprise, they accused him of being an ISIS supporter. He says they beat him up and detained him for several days before letting him go. Two months later, the family lives in equal fear of ISIS and the security forces. They have permanently relocated, and Imad only returns to the farm in daylight to feed his sheep and water his wheat and vegetable fields. Asked if he’d help ISIS if they contacted him again, the farmer’s answer was simple. This article was reported in partnership with The Investigative Fund at The Nation Institute, now known as Type Investigations. A related two-part television series aired on PBS NewsHour Weekend on September 9 and September 16, 2018.